It was announced on April 20th, 2016 that Keeper of the Grove would receive a nerf. Health reduced to 2, down from 4. Keeper of the Grove is a strong and versatile minion that combines Silence with solid stats, which made the decision to include it in every Druid deck virtually automatic. 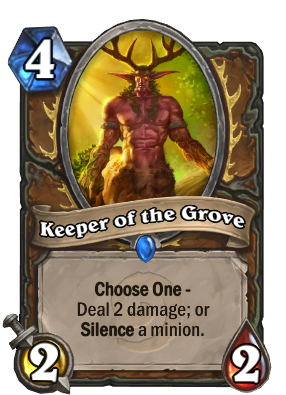 Whether or not to introduce a source of Silence to a deck should require some decision making, so Keeper of the Grove shouldn’t be a default choice for all Druid decks. Its stats have been changed from 2/4 to 2/2. Choose One - Deal 2 damage; or Silence a minion. These guys just show up and start Keeping your Groves without even asking. Keeper of the Grove? More like... keep them off in droves. This might be semi-playable with Deal 3 damage or Silence a minion. Even then it'd be hard to justify as a 4-drop class card, but it might at least be on basic card level. Giving it 2/3 stats and that might just make it actually on class card level, and still arguably weaker than before. The damage always felt like the lesser of the two options. Eh, Druid's versatility needs to be kept in check. I'm not sure I agree with the full 2 hp reduction, but certainly some nerf was necessary. It has same stats as a 1 drop now, that nerf was so stupid. Druids and their entitled one drops. Hmph, in my days we had 1 mana 2/1s and liked it! You didn't play 1 mana 2/1s naked though. They were always worth at least 4 stats. they ruined a perfectly balanced card just like ironbeak. I dont understand why does blizz hate silence mechanic so much. They've changed way how Keeper works with Fandral. Now, he works exactly as earthshock does. Blizz you nerf this but add Darkshire Councilman and Flamewreathed Faceless. Druids hate you ... A lot!! Every time I hear Ben Chodes laugh I want to punch kittens!! Again another Druid card that will never be played. Actually I think the Flamewreathed is okay. It's too slow for even midrange shaman to play now. Imagine that. 3 2/2 deal 2 would be OP. In any case, though, the current version is stupid. 3 mana 2/2 deal 2 or silence is op. Deal with it. 3 mana 2/1s that just deal 2 (or had charge and divine shield) are seen as really good minions. Disciple of C'Thun: -1 health for 1 mana less! Spellbreaker: same mana for +2/+1! Just tested it with Fandral Staghelm both modes happens simultaneously so, it kills divine shield minions and doesn't trigger deathrattle or damage effects..
Lol advice for the future. D/e any, and I mean literally any nerfed cards you have for full dust. There is literally no reason not to, unless you find it too much work to craft them again when you need them.